Old wooden boxes are typically coated with a polyurethane varnish and a stain. The varnish, over time, erodes and may become scratched or gouged. The box itself, while remaining highly functional, starts to look worse for wear. The damage to the wood's surface can be fixed, and the box itself can be refinished and restored to its original appearance. Stain cannot be removed without heavy sanding of the wood, but the finish can be cleaned up readily. Sand the surface of the wood with 50-grit sandpaper. Use soft, slow strokes to remove the old varnish. 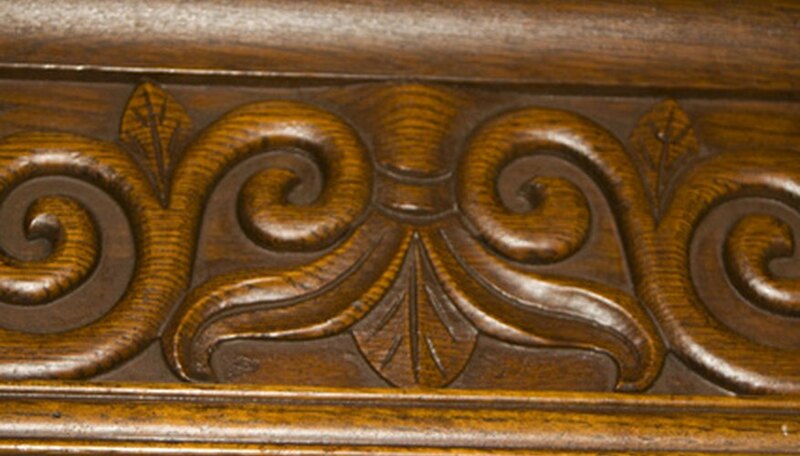 Follow the grain of the wood and contours of any decorative elements. Repeat the process with 120-grit sandpaper and 220-grit sandpaper until the varnish is removed and the surface of the wood is smooth and clean. Fill in any gouges or deep scratches with stainable wood putty. Sand the wood putty down so that it blends into the surface of the box. Apply a light-colored stain to any areas that appear uneven in color on the remainder of the box's surface. Use a soft rag to apply the stain. Rub the stain into the wood using circular motions. Allow the box to dry fully before continuing. Apply a coat of polyurethane varnish with a paintbrush. Follow the grain of the wood as you apply the varnish so that any brush strokes blend with the grain. Apply a thin coat and allow it to fully dry before applying additional coats.